Skype for iPhone is one of the best audio and video calling app on iTunes. Skype is available for all versions of iPhone. If you using iOS 7 and above then you can use the latest version of the Skype for iPhone app from the iTunes. If you are using below iOS 7 then you need to download Skype for iPhone 4.17 which is available for free on iTunes. Skype is also the most popular app in social networking category. It’s available in multiple languages. Skype is also available for Apple watch. Skype for iOS 8 and Skype for iOS 9 are available for you to download in your newly purchased iPhone 6 or iPhone 6 Plus or other SE models. You can receive and send instant messages for free to your loved ones in Skype. You can also send photos and video files for free. Face to face video call can be done over a 3G, 4G and Wi-fi connection. In fact Skype is literally good sometimes over a 2G connection also. With the Skype’s, anti shake technology the video calling will be totally smooth. I totally love this feature. You can also call other mobiles and landlines with Skype with low cost. You need to take credits in your account for that. It’s much cheaper than others. iOS 7 and Above – Download Version Skype for iPhone 5.12.2 from iTunes now. This version is compatible with iPhone, iPad, and iPod touch. This versions works on iPhone 4, iPhone 4S, iPhone 5, iPhone 5C, iPhone 5S and iPod touch 5th Generation. Skype for iPhone 5.12.2 is optimised for iPhone 6 and iPhone 6 Plus. iOS 5 and iOS 6 – Download version Skype for iPhone 4.17 from iTunes now. How to Make Video Calls? Making video call is very easy. You need to add your friends in the contact list. If you haven’t added them then find them using their Skype ID and add them. Find Skype from the list on tap on slider to grant microphone permission. Click on PEOPLE to view your contacts. People having Camera next to their name can be video called. Select the person whom you want to call. Now Click on video call button to start the call. Click this to change between front and back cameras. It will turn your microphone on and off. You can turn the speakerphone option on/off with this one. You can switch to headset with this one. Using this one you can view and send your instant messages. You can not share screens or involve in a group video call on iPhone. However you can share screens on Skype on Windows and Skype on Mac. Many people might experience bad video quality over Skype. It mainly happens due to bad network. You are required to have 3G/4G or wi-fi connection for good video quality chat. So in order to fix the bad video quality, subscribe to a high speed internet connection. How to Make Audio Calls? Click on Skype in your iPhone. Click on PEOPLE option on top of the app. Click the contact whom you want to call. Click the call button at the bottom of the screen. Suppose somebody is calling you then you will see a green call button. Simply tap the button to receive the call. You can call anyone on Skype who’s in your contact list. It doesn’t matter whether they are using the app on Windows, Android mobiles, iPad or Mac. Follow the process above and you will be able to call anyone in your contact list. Yes, you can make very low cost calls to mobiles and landlines using Skype for iPhone app. You can make domestic calls as well as international calls using the app. However calling mobiles and landlines is not free. You need to take Skype Credits or Subscriptions in your account. Once you take either one of them then you will be able to call any number. Cost per call will be very low as compared to your carrier charges. Check out the below links to understand more about credit and Subscription. Open Skype for iPhone app. Click on CALL PHONES or Click on DIAL PAD icon. Enter the number and then press the green call button. Once you have entered the number then you get the option for saving it right away. In latest version, as soon as you type in the number the Skype will start showing you the contacts from your list who matches the number. If you want to call the person from inside the Skype contacts then follow below steps. However it will only work if they have an associated phone number or landline in their account. Open the app from iPhone home screen. Click on PEOPLE option at the top of the screen. Click on the contact to view their profile. 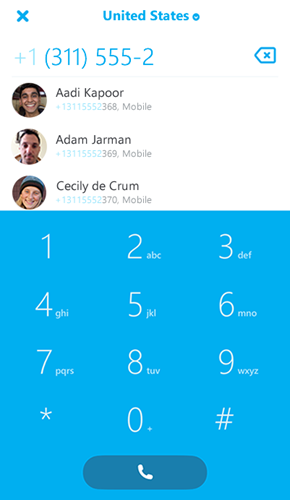 Click on VOICE CALL or CALL ICON (in Skype 5) and choose the number you want to call. You can also call contacts from your iPhone contacts/iPod contacts. All you need to do is follow below 3 simple steps. Select the contact and click on the phone number. Tap the call icon to make the call. How can you Start or join a Group Call? Making a group call is pretty simple. If someone make a group call then he will add your name. So if you are invited in the group call, you will get the call. You simply need to pick up and you can enjoy the call with others. 1. Sign in to Skype app. 2. Click on NEW CHAT icon and select the contacts whom you want to add in the group from the contact list shown. 3. Once the whole group is setup then click on the call icon and Skype will call all your friends. When everyone is connected then you are all set to talk. Skype is available for iPads too. You need to have iOS 5 and above on your device. You can do same functions on your iPad too. It feels the same. You can also do video messaging in iPad. If you have opened this link through your iPad then click on the above link. If you haven’t then open playstore on your iPad and search for Skype for iPad and download it. Sign in with your Skype ID. If you don’t have one then register a new one. Add your friends and start chatting or calling right away. If you know your friends Skype ID then you can search the same in the Skype. If you guys are using old version of Skype and want to get new features then you should update it right away from the Apple Playstore. However it will also degrade some of the old functions. There should not be any problem. If you don’t feel comfortable with the latest version then you can revert back to the previous one at any point of time. Yes you heard me right “Skype for Business “!!! Most f you must be already using Skype to stay in touch with friends and family in your life, you will be happy with the video/voice calls and more over the simplicity of the application would have impressed the most. But now it’s time for us to get impressed by the power and simplicity of the new “Skype for Business”. In the new Skype for Business it’s easy to find and connect with co-workers no matter what device you have to reach businesses with an enterprise-grade, secure, IT-managed platform. If you’re a regular user of the commercial version of Skype, then the “Skype for Business” will look very familiar to you. Before I could tell you more about the new Skype for Business let me tell you the “Microsoft Lync” now Skype for Business. The Lync of Microsoft which was used as the office communicator worldwide has now become the new “Skype for Business” with few new features. If you’ve used Lync, you’ll recognize all of the features you already use but in a fresh new interface with simplified controls and some new additions. So now the question is what’s new! Let me list out few of the things which stand out. New look and feel: This new look of “Skype for Business” is the main attraction and user friendly. 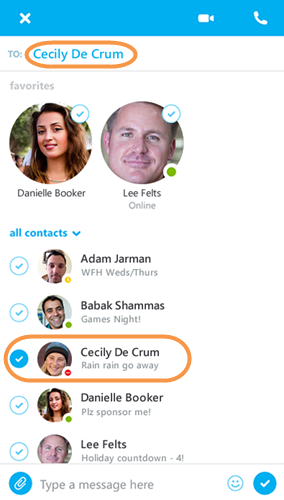 Skype for Business Contacts list of course has all the essential Lync features are still there like the Quick Actions buttons, which let you IM or call a contact and more with just one click or tap. If permitted for your organisation, you can integrate Skype for Business with your organizations non-unified communications (UC) phone system, and then select your desk phone or your computer to place calls from. This lets you use Skype for Business to control your desk phone. In order to integrate your desk phone with Skype for Business Go to view Phones options, and then enable integration with your phone system by checking the check box. Skype for Business users can connect via the Internet with of millions of Skype user’s from the Skype for Business user interface. If the person you are looking for is in your organization, keep the My Contacts tab selected. If the person you are searching for is not in your organization but you know they have a Skype account, click the Skype Directory tab to search for them among the millions of Skype users. Knowing their Skype ID and location helps narrow the search quickly. Call Monitor is a very nice Skype feature that’s available in Skype for Business. With the Call Monitor, you can move back and forth between a full Skype for Business window, for when you’re actively participating in the call, and a compact version that lets you continue to monitor call progress while focusing on other tasks. The Call Monitor window will be visible during an audio/video call whenever the main conversation window is minimized. To show the full conversation window again, double-click the Call Monitor. Access to the dial pad and call controls is much improved. For public switched telephone network (PSTN) calls, the dial-pad and call controls remain visible throughout the call. Skype for Business now has the same set of emoticons found in the consumer version of Skype. You can turn off emoticons in Skype for Business by going to Options > IM. You can arrange a meeting with up to 250 people even if they’re not having Skype for Business. And all they need is a phone or internet connection. And all the conversations are protected by strong authentication and encryption. New Skype-for Business iOS app. The new Skype for Business for iOS app brings instant messaging (IM), and voice and video calling to your mobile device. Now the Skype-for Business iOS app is launched to the public, will automatically update the Lync app that was previously installed on users’ iPhones or iPads. Also the new version will resolve some of the issues had experienced by the user earlier. In addition, users will have an updated dashboard featuring a search bar for locating contacts, a list of upcoming meetings, and a list of recent conversations.The search bar will allow the users to find anyone from their company’s Global Address List by email alias or first or last name, or phone numbers, though the app will also allow users to chat with anyone who uses Skype, even if they’re not part of the organisation . All that’s required is that the other users have a Skype ID. What’s new about this app. 1. A full-screen video calling experience. 3. The ability to view content being shared and the speaker’s video at the same time. Go the App Store on iPhone to go to the App Store and search for Skype for Business. On your iOS device, Keep passing all pages of apps until you see the Skype for Business icon. Tap the Skype for Business icon to open the app. Enter your sign-in address and password, and then tap Sign In. You will be asked for both a user name and a sign-in address. Sign-in screen in for Skype for Business on iOS. Enter your mobile number with country and region codes. Tap Next. If applicable, choose whether to sign up for the Customer Experience Improvement Program and click next. Now you have your all new Skype for Business on your iPhone. Skype for Business runs on iOS 8.0 and later. On, under Upcoming section of main screen, tap the meeting you want to join. Upcoming meetings screen with one meeting highlighted. You can also click the meetings button to see all the items on your calendar. Select the meeting that you want to join, and then click Join Meeting. If this is an online meeting, you’ll see a Quick Join button. Click on it to go straight to the meeting. The Quick Join button is not currently available on iPad. You’ll be connected to audio or video using VoIP either by using Wi-Fi or your cellular data plan. If you have Skype for Business calls you on your mobile phone and you can accept the Skype for Business call to join the meeting. This happens only when the voice and video call options are switched on n and your device isn’t connected to network. If not you can join a Skype for Business meeting or conference call by phone. You can even dial in to the meeting from any phone by dialing in the “Join by Phone numbers” given in the list in the meeting invitation. This meeting lobby is an online waiting area, which will be controlled by the meeting leader. Meeting leader controls access to the meeting so you might need to wait until the meeting leader admits you in. If you’re waiting in the lobby, don’t jump to other applications as your request to join the meeting will be cancelled. Skype problem with the recording device is one of the major problems faced by thousands of people all over the world. Skype microphone problem or recording device problem can be easily solved if you are little careful and know about audio settings of your operating system. Most of the time it’s not a problem with the recording device but the problem with your microphone itself. Sometimes the people don’t plugin their microphone properly and then they complain that they have a problem with the recording device. I am going to give you some of the common and easy fix methods to solve Skype Problem with recording device. Skype app for iPhone Download Instructions are Given at the bottom. Follow the below methods step by step so that you don’t miss anything to fix your Skype Problem with Recording Device. Make a Test call – Calling Skype test call is the best way to see if your microphone is working properly or not. Call Echo123 and record your message. If you can hear your voice after the beep then it means your microphone is configured properly. If you don’t then you have some other problem. Check You Microphone – It depends what kind of microphone is being used by you. Is it build in mic, a wireless mic or some other type? If it’s a built in then make sure it’s not muted in the Skype itself which will create a problem. If it’s wireless then check for low batteries which create bad connection or no connection at all. Check Sound settings – If you are using Windows 10 or any other version then you should head over to sound settings in Control panel and check for recording tab. You should see whether microphone is enabled or not. Enable it and boost it to 100% percent. If you are using Macbook then open your settings and go to audio settings inside it. Check for microphone settings. Check for Skype iPhone Sound Settings here. Sometimes you need to manually select your headphone inside the sound settings which has mainly two options. One for your headphone and other for laptop speakers. Microphone is connected to headphone most of the time. You need to select headphone as your primary input and output device and laptop will immediately change it fixing your audio problems.